If you travel to Taipei for the first time, recommend to take train in Taipei, you will be able to enjoy Taipei by taking the train from only 10 city stations. Travel by train will save your journey time and you can visit many places in one day. There are full information of direction and places at each station. Your trip will be worry less and very convenience. You will find the place to visit which are closed to the train Exit. Let’s see the train map explained only recommended 10 stations to be easy to understand. 15 minutes from Taipei Main Station (Train + waiting time) Fare 25NT I-Pass Card & Easy Card 20NT Exit 4 will be connected to Taipei 101 Department Store. You can enjoy Taipei scenery at floor 89-91. The ticket can be purchased at 5th floor of the department store (500NT). You may enjoy shopping or having meal at food court that located at the basement of the store. It is a big food court with various restaurants. The price for a set of food will be around 120-180NT. Department store will be opened Monday-Friday: 11:00-21:30 hrs./ Saturday-Sunday : 11:00-22:00 hrs. City view floor 09:00-22:00 hrs. One more thing that you should not miss is selfie yourself with Taipei101 building for your good memory. Recommend to use Exit 2,3 to see the best location for selfie with the whole building of Taipei101. 40 minutes from Taipei Main Station (Train + waiting time) Fare 50NT I-Pass Card & Easy Card 40NT After exit from the station, walk to river side to Gong Ming street. It is Dan Shui Market where a lot of restaurants located along both sides of the street. On the river side street, not only river view that you will enjoy, you also will enjoy shopping at the various shops . 500 meters from the station, it is Dan Shui Pier where you can take a both transfer to Pali (fare : 23NT by cash or Easy Card). Boat will come to the pier in every 15 minutes. After arrival at Pali, it will be nice to walk around the market or bicycling. Dan Shui is also the place for sightseeing of historic sites. You just walk from the station for 1 km. or take local bus to the historic sites. 10 minutes from Taipei Main Station (Train + waiting time) Ticket fare: 20NT for I-Pass & 16NT for Easy Card Exit from Exit 1, walk along left side of the street which will lead you to Shi Lin night market. Walk across the second cross walk and turn right where you will see Da dong street. It is small street but favorite as walking street and street food market and shopping area. From Da dong, you can find a building where the food courts are at under ground floor. A small street next to Da dong is a big street, Wen lin where you can enjoy shopping at the shopping malls (various shops in the buildings). ‘Shi Lin’ is big night market and popular in Taipei and the open hours of each shop are different. The shops in the shopping building are normally opened around noon but the street market shops are normally opened at late afternoon until 23:00hrs. Just the suggestion, fruits sold at this market might be look wonderful but comparing to other places, buying here is a lot more expensive. You can find cheaper price at super market such as Carrefour, Wellcome, A Mart. 6 minutes from Taipei Station (Train + waiting time) Ticket fares: 20NT for I-Pass & 16NT for Easy Card From Exit 1, walk passing by small park or after getting out from the train arrival point, you can direct to the underground way to Longshan and at the end of this way, there is an escalator going up to Longshan Temple. You will find statue of Guan Yin, Goddess of Mercy and other goddess. The temple is opened every day at 6:00-22:00 hrs. 5 minutes from Taipei Main Station (Train + waiting time) Ticket fares: 20NT for I-Pass & 16NT for Easy Card From Exit 1, walk further 200M, you will find cross walk under the bridge. Walk across cross walk and you will find Huashan1914 Creative Park at right hand side. This place is the center of hipsters and ones who love art. Several of art exhibition are always set up here with art pieces from many new artists sold at this place too, including restaurants and Movie Theater. Open hours are normal standard for the Exhibition Hall. 5 minutes from Taipei Main Station (Train and waiting time) Ticket fares: 20NT for I-Pass & 16NT for Easy Card Exit 6, it is Xi Mending area which is the most popular shopping area in Taipei for tourist. You can find dresses, shoes, various fashion stuff including restaurant, snack and beverage places, department stores, Movie Theater. There are a lot of staying places too. At night time, you will enjoy many of street shops and food. 30 minutes from Taipei Main Station (Train + waiting time + changing train) Ticket fares: 30NT for I-Pass & 24NT for Easy Card Exit from the station, walk along the left side of the street, cross the small cross walk, it is the way to stair way to Bi tan river bank. You will enjoy the clear and green color of the river. There is river bike available for rental. The opposite side of the river is mountain with beautiful scenery. This place is good for walking around, jogging, bicycling. Recommend to put this place in your travel plan for the early morning activity in time, before visiting some other places where they are opened late morning. 5 minutes from Taipei Main Station (Train + waiting time) Ticket fares: 20NT for I-Pass & 16NT for Easy Card From Exit 5, turn right and walk to the direction to a park. You will see Liberty Square and 2 Chinese style buildings which are National Theater and National Concert Hall. The National Chiang Kai-Shek Memorial Hall, a national monument, landmark and tourist attraction will be at another end of this square. Two sets of white stairs, each with 89 steps to represent Chiang's age at the time of his death, lead to the main entrance. The upper level contains the main hall, in which a large statue of Chiang Kai-shek is located, and where a guard mounting ceremony takes place in regular intervals. (Every hour from 9:00-17:00hrs) The ground level of the memorial houses a library and museum documenting Chiang Kai-shek's life and career. 35 minutes from Taipei Main Station (Train + waiting time) Ticket fares: 35NT for I-Pass & 28NT for Easy Card From Exit 1, walk for 100m, you will find the front entrance of Taipei Zoo. The entrance fee is 60NT (you can pay by cash or Easy Card). You will see Panda, Koala, penguin and many other animals in this zoo. Many shaded areas and clean rest rooms are around the zoo. You may take visitor’s tram which can take you from below zone to upper zone. The price for tram is only 5T and you can use coin or Easy Card). From Exit 2, turn to the street and then turn left for 300m where you will find cable car which will stop at 4 stations. Ticket from starting point to the end point is 120NT with 20NT discount if you use Easy Card on week day. In the cable card, you will see beautiful scenery of Taipei. The cable car is operate TUE-SUN (closed on Monday) during 9:00-21:00hrs. 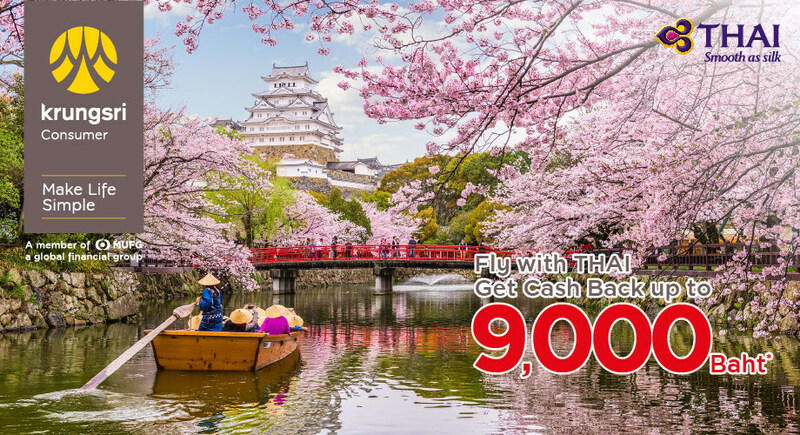 Get cash back 9,000 Baht when purchased tickets via thaiairways.com or Thai Airways Mobile App.